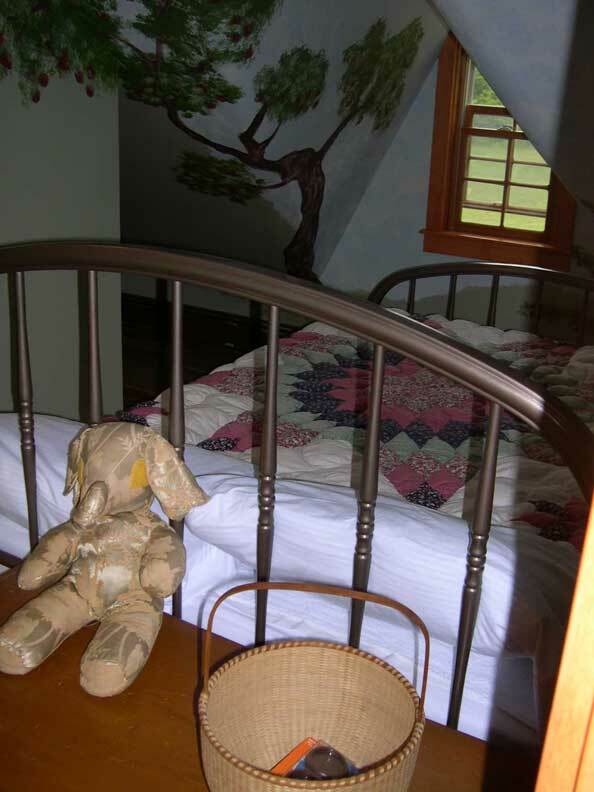 Sculptured Rocks Farm Has Five Guest Rooms Including Our Newest ROOM The Bambi Dream Stream. The Bambi Dream Stream Is A New Classic Airstream Complete With Kitchen, Bath with Shower and Queen Bed. The Bambi Dream Stream has a queen bed, kitchen, and bath with shower and does not include breakfast. 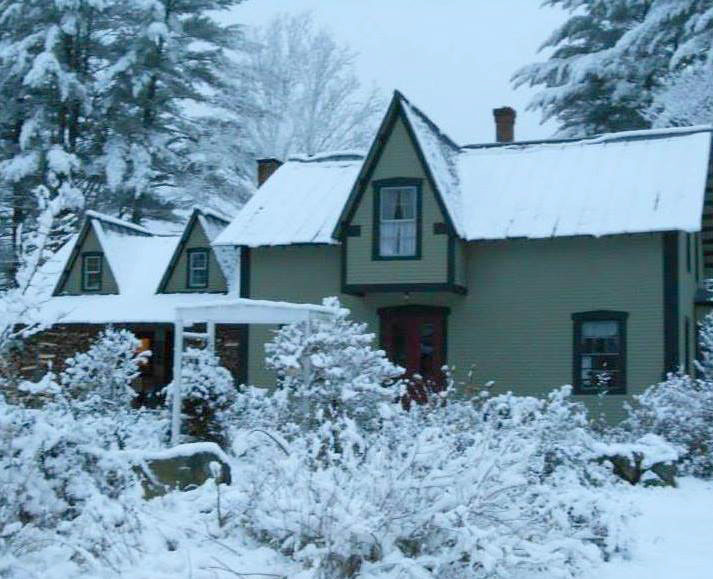 It is a cozy private getaway that sleeps only two. And these are our other lovely rooms. looking out towards Jewell Hill. 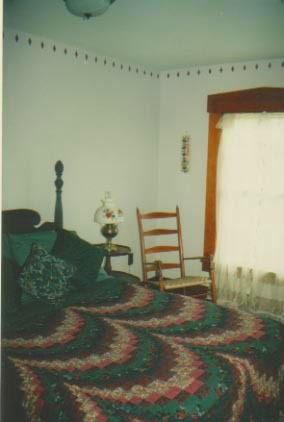 The bed is covered in a quilt handmade by Janet Maves. 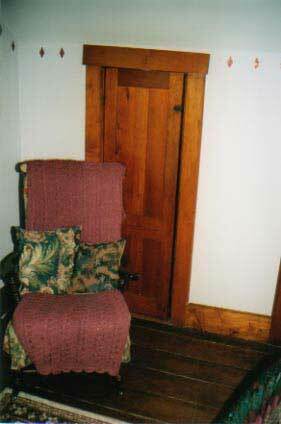 The Jewell View Room -- a spacious room that has a view of the ledges on Jewell Hill home of a mica mine in the early part of the 20th century. This room includes a double bed and a very comfortable fold out twin bed available for an extra person at an additional charge of $20 per night. This comfortable room shares a bath with Violet's Room. The shared bath has a shower and a newly restored antique claw-foot tub in the Gothic gable. Sit in the chair overlooking the field where the second owner of the farm, George Hikel raised sheep after he immigrated here from the middle-east in the late 1800s. Includes country breakfast. 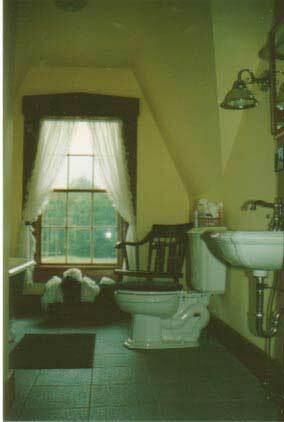 The Jewell View Room and Violet's Room share a bathroom complete with an antique clawfoot tub (and a modern shower). A bubble bath is a relaxing way to spend an afternoon. Violet's Room is not very big, but it is cozy. 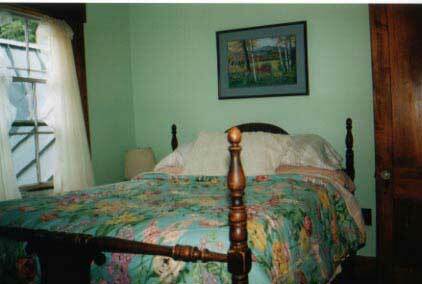 Dawn's Grandparents antique bed just about fills up the room, but you will find this room a welcoming get away. 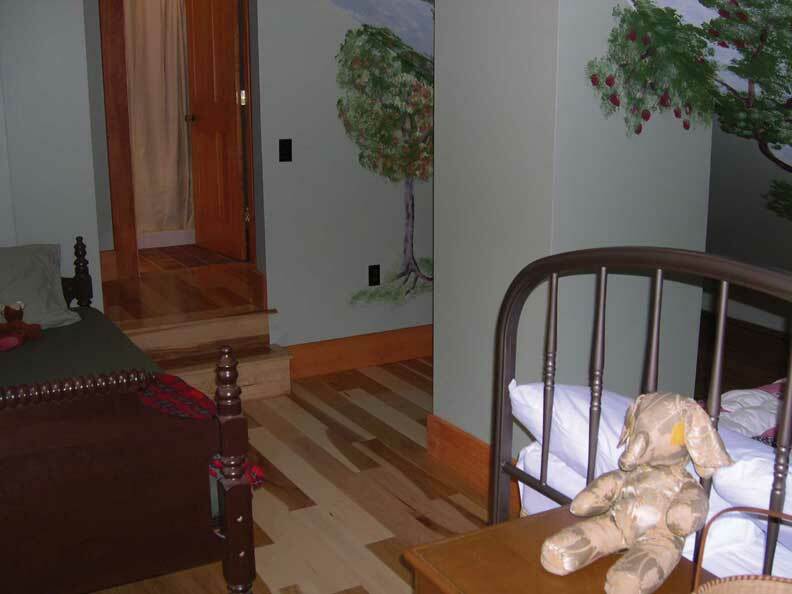 Violet's Room -- is a quaint little room that we named for one of George Hikel's daughters. Since he had ten children, she probably never had her own room, but we think if she did she would have picked this one. 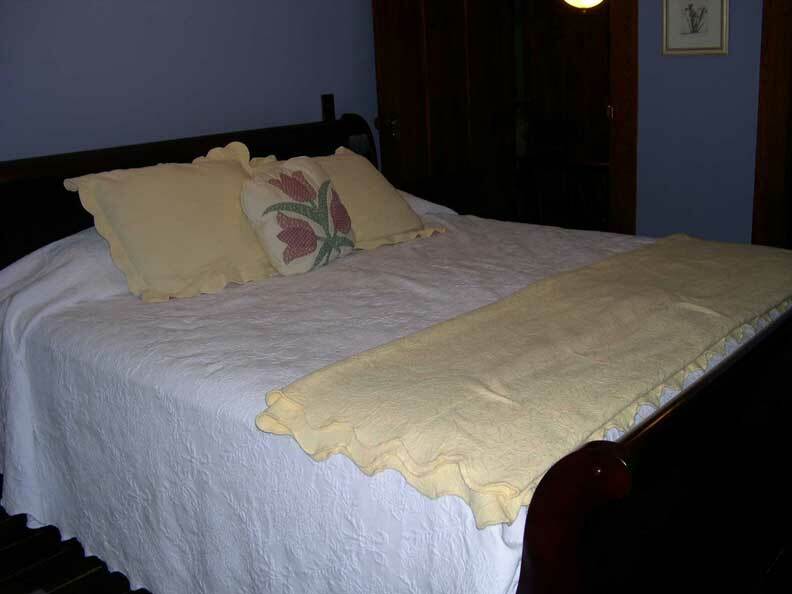 It is a sunny little room with a comfy double bed that shares a bath with the Jewell View Room. 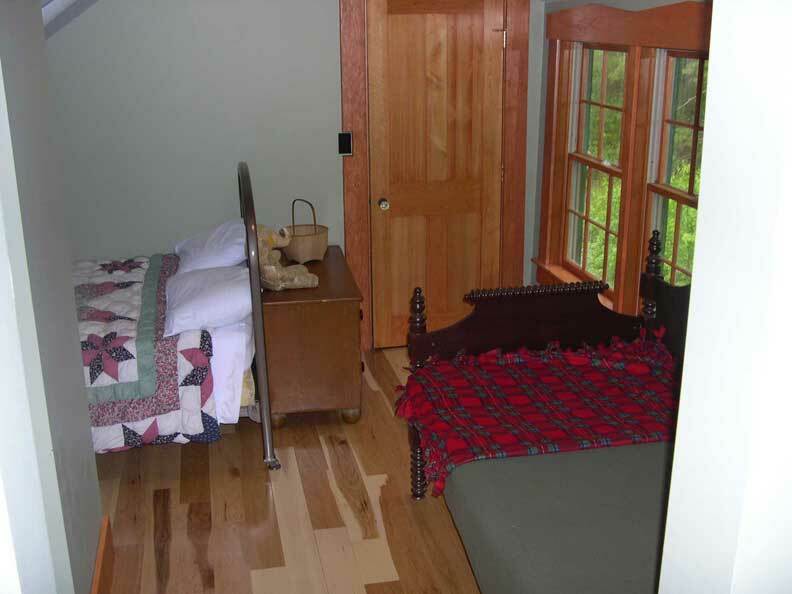 Together these two rooms make a perfect set for a family or close friends since the bath is only shared by two rooms. It is the favorite room of our Granddaughter Makayla. Includes country style breakfast. The Chestnut Suite is filled with relaxing shades of blue, yellow and white. The Chestnut Suite -- is the most romantic room in the Sculptured Rocks Farm. It is a large room with a private bath. The newly restored, antique claw-foot tub and marble floors in the private bath make it a wonderful place to relax in a tub of hot bubbles with a glass of champagne. This room has a king size bed. A couple of comfy chairs in the corner makes this suite such a precious little getaway you won't want to leave your room. Includes country style breakfast. 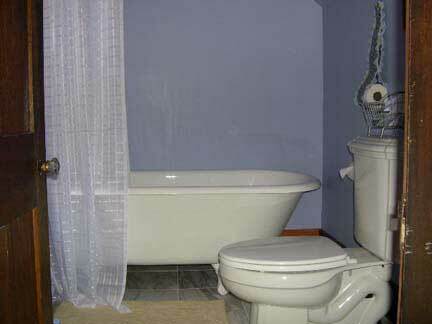 Enjoy the antique claw foot tub that also has a shower. Classic white marble covers the bathroom floor. The Hunters Suite -- a two room suite that is perfect for families or close friends. It has a private bath with shower, one double bed and two twin beds and a set of bunk beds and can sleep up to six. Includes country style breakfast. Do you have a group of four or five couples? We can accommodate you all and will discount the above rates if you rent all four rooms (or add on the den if you have five couples). Email us for more information about a multi-room discount or discounts on longer stays. Sculptured Rocks Farm is surrounded by 158 acres of land for all types of activities.